As a UC Berkeley student studying public health, I spend a significant amount of time studying biology, chemistry and public policy. Although none of my classes ever speak about gluten or Celiacs directly, I constantly relate what I am learning to my gluten free lifestyle. Sometimes the best way to make sure you are 100% gluten free is to go back to the basics: biology. Studying the respiratory system made me realize the real threat of airborne flour for a Celiac. It should not come as a surprise that we inhale dust and debris on a constant and regular basis. If flour is in the air then the people within that proximity will inhale it. So what is the big deal? Inhaled air goes directly to my lungs, not my intestines, so who cares? 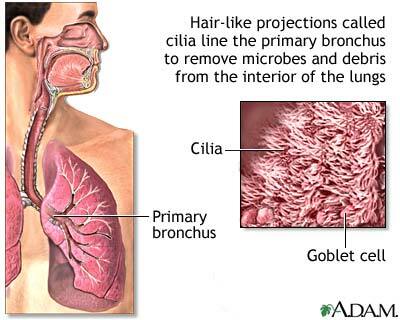 Inhaled debris, dust and flour enter the bronchial tubes and are then pushed away from the lungs by hair-like projections called cilia. The cilia, working in conjunction with the mucous lining of the passageways, remove debris by pushing it back into the throat where it is then swallowed. The debris only fully leaves the body once it is digested and excreted. To guarantee your safety, stay away from dry flour. Before understanding the biological basis for this phenomenon, I experienced it. Every Christmas Eve my very Italian family makes ravioli from scratch, an all-day endeavor. My first gluten-free christmas, I knew I could not eat the food but I was happy that I could still help make the ravioli. After about two hours in the kitchen I started to feel…foggy. I felt tired and ill and really wanted some “fresh air.” I left the room to take a breather and when I reentered the kitchen I noticed that we were working in a dust cloud! Flour was everywhere! Try to avoid dry flour. It takes a long time for flour to fully leave the air. Some articles that I have read say that flour can remain airborne for up to 24 hours. If you are going to bake with non gluten-free flour, I suggest wearing a mask and/or gloves. I know it sounds dramatic but you really do not want flour underneath your nails, not to mention that people absent-mindedly touch their mouths or pick up something to eat while messing around in the kitchen. Another risk associated with airborne gluten is contaminating surfaces in your kitchen. If you are baking with gluten-containing ingredients, the airborne particles will likely settle on your counters, cutting boards, stove top etc. If you do use dry flour in your kitchen make sure you clean your kitchen throughly afterwards to avoid cross-contamination when using your kitchen! That’s such a great point! I am new to the gluten-free world and have had so many accidents with cross-contamination it seems. I had never thought of the airborne aspect though. Great post! This post does a HUGE disservice for the entire Celiac world. It should be removed. There is not one ounce of ‘scholarship’ behind the post. please remove it. All of the major nonprofits and research organizations dedicated to studying celiac disease have described the potential risk of being exposed to gluten in the air. The American Celiac Disease Alliance writes that “Wheat flour can stay airborne for many hours in a bakery (or at home) and contaminate exposed preparation surfaces and utensils or uncovered gluten-free product.” I actually have a shared kitchen with people who are not gluten-free but we avoid baking gluten-products in the apartment because surfaces can easily get covered in flour. If you are around excessive flour, for example my family used to make ravioli every year, inhaling mass amounts can actually cause symptoms in people who are very sensitive to gluten. Everyone’s experience with celiac disease is unique and it is better to be safe and healthy. then heating in the microwave for a nice hot lunch. gluten-free baking flour, in detail, to communicate her full knowledge. blood pressure, and other related issues. I have a question, I have celiac and I work in a bakery, recently I had to have an EGD done the morning of the test I worked with a lot of flour, during the procedure my Dr. stopped and said she couldn’t go any further because I had food in my stomach and my esophagus. Could the airborne gluten cause this problem?